Popular 7.79m working height electric self-propelled scissor lift with a 0.91m platform extension. Comes with new LOLER, 6 month warranty and fully serviced. Market leading compact electric scissor lift. Suitable for both indoor & outdoor use on a solid level floor. Supplied with 6 month warranty. 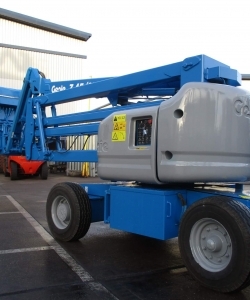 The Genie GS3246 combines an 11.50m working height with a lift capacity of 318kg. Supplied with a 6 month warranty. This 2010 GS2632 has just 210 hours on the clock. Supplied fully serviced, with a new 6 month LOLER certificate and 6 month warranty. 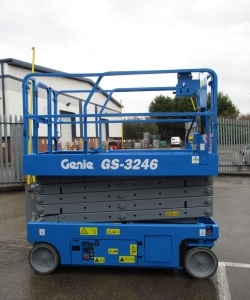 The popular Genie GS2632 has an impressive 9.92m working height whilst being just 0.81m wide. Great for working in narrow, tight spaces. Supplied with 6 month warranty. This 2007 GS1932 with just 382 hours on the clock boasts quiet electric, zero-emissions operation and is ideal for indoor and outdoor applications on ﬁrm, level surfaces. 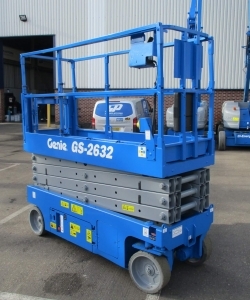 Genie's GS1932 is the worlds most popular scissor lift. This 2007 model comes supplied with a new 6 month LOLER and 6 month warranty from Workplatform. 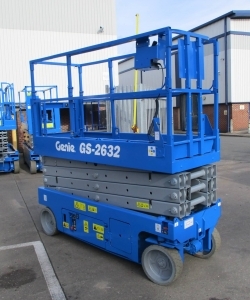 Genie's GS-3246 is popular due to its 11.50m working height and roomy 1.17m wide platform that extends in length to 3.18m. Supplied with a 6 month warranty. 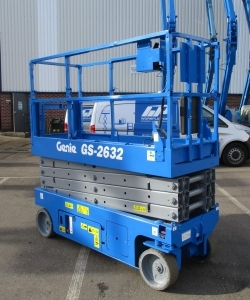 The Genie GS3246 combines a 11.50m working height with a lift capacity of 318kg. Supplied with a 6 month warranty. Supplied re-sprayed, fully serviced, new 6 month LOLER certificate and 6 month warranty. Genie GS2668RT with foam filled rough terrain tyres and self levelling hydraulic outriggers. New 6 month LOLER and 6 month warranty.